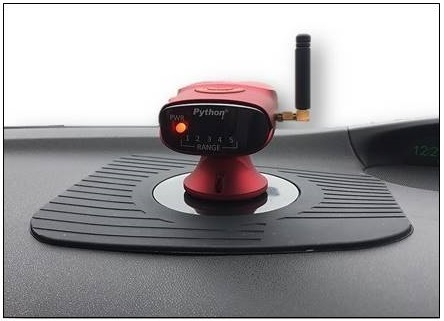 The antenna is the air interface connection between the Python Detector and the transmitted signal from a emergency services vehicle. Antennas come in may forms and sizes but the most common types of antenna used in mobile communications are Monopole or Dipole antennas and are Omnidirectional antennas. The radio waves from a transmitting Omnidirectional antenna radiate power uniformly in all directions on the horizontal plane. 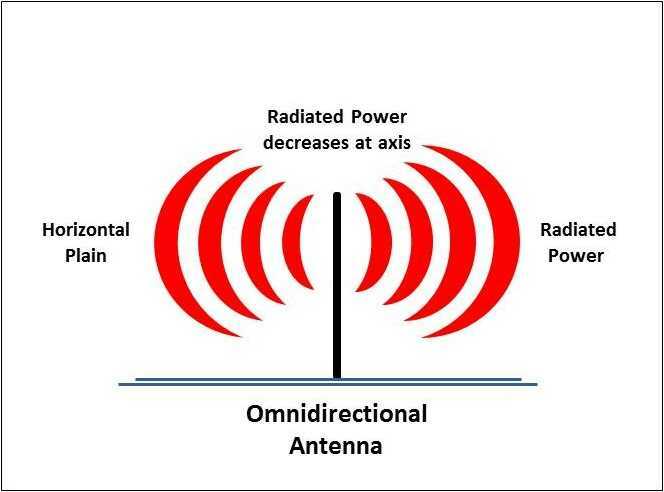 The transmitting antenna radiates maximum power in the horizontal plane and this decrease with elevation above or below this horizontal plane and falls to zero at the antenna's axis and viewed from the side the radio waves from a transmitting Omnidirectional antenna form a doughnut shape. Omnidirectional antennas are oriented (polarized) vertically. 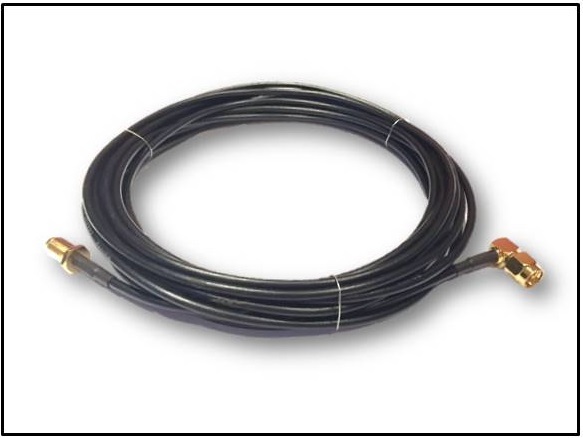 Dipole antennas are ground independent, meaning they are designed to perform efficiently with a minimum or no ground plane. 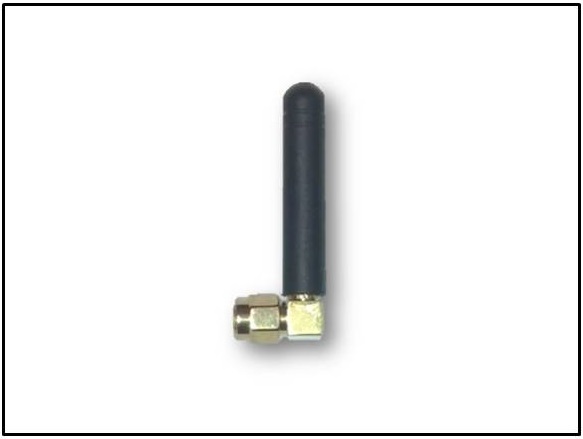 To make this full antenna length more practical for day to day applications the length can be reduced in whole number multiples, these are often referred to as 1/2, 1/3, 1/4 and 1/8 wave antennas. Antenna gain is the relative measure of an antenna's ability to direct or concentrate radio frequency energy in a particular direction or radiation pattern. In a receiving antenna such as used in Python, the gain is how well the antenna converts radio waves arriving from a specified direction into electrical power. When no direction is specified, "gain" is can be referred to the peak value of the gain, the gain in the direction of the antenna's main lobe. 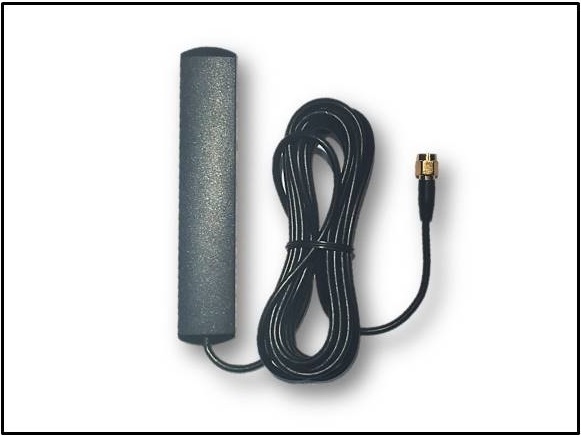 Low Gain omnidirectional antennas: as used in our Standard Antenna are a helical construction where the antenna wire is formed into a helix allowing the antenna to be smaller. Low Gain antennas radiate at a wider angle and in general have a shorter detection range but can give good level of detection in an urban or hilly environment. 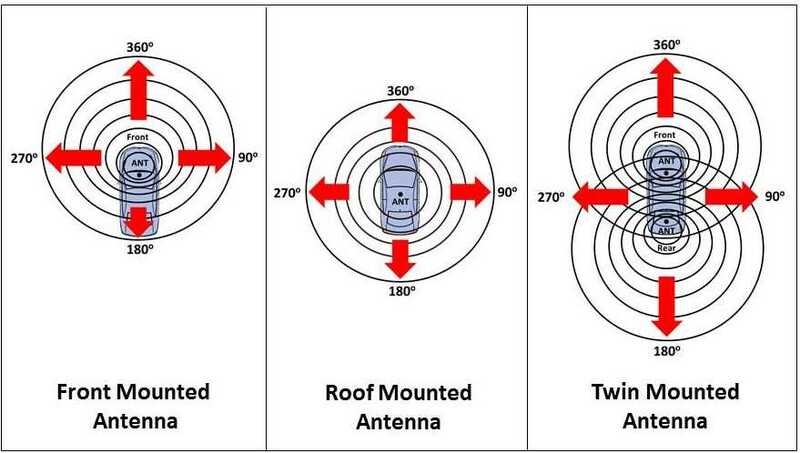 Higher Gain omnidirectional antennas: such as our Windscreen Antenna or an aftermarket Magnetic Roof Mounted Antenna radiate at a lower angle in a more horizontal direction providing greater detection capability in an open environment such as a motorway where there is a relatively flat and open topology. Dipole antennas are oriented vertically and are typically used for non-directional applications where the received signal can be detected from all directions (360 degrees). The types and positions of the antenna and their radiation pattern can determine the detection capability. Our Standard Stubby or Windscreen Antennas give good all round detection with a slight radiation bias pattern to the front of the vehicle. Roof mounted antennas give a slightly better all round detection with an equal radiation pattern. You can also use a combination of front and rear antennas and in this type of installation you would need to use a combination of Low Noise Amplifier and Splitter. 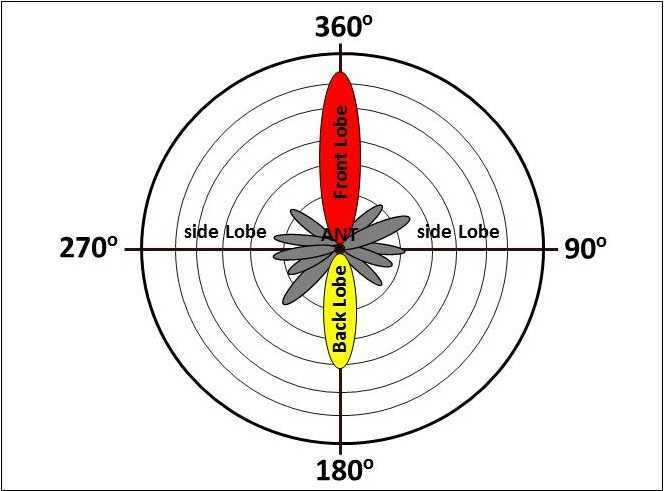 The detection range depends on a number of factors such as the strength of the transmitted signal received by the detector, the distance from the transmitted signal from the detector and the surrounding terrain. In general antennas should be mounted as high as possible, there are some consideration to the position of the antenna is needed to avoid blocking the RF signals to your detectors. If you are using the Standard Stubby Antenna supplied with your detector ensure that the detector is mounted on your dashboard or windscreen. If you mount the detector below the height of the dashboard you will reduce the detection capability. If you want to mount the detector in your centre console then we suggest to use a Higher Gain Antenna, these can be either windscreen mounted or Magnetic Mounted. Newer types of vehicle windscreens can contain a metal oxide that help to keep the interior from getting hot but they also block the Transmitted RF Signals to the Antenna. Some vehicle windscreens also have a built-in Radio Antenna and/or Heater Elements; these can block some Transmitted RF Signals to the Detectors Antenna and reduce the detection capability. If you are using a Higher Gain Windscreen Antenna, we recommend that it must be placed 3 CM from any object that could interfere with the detection. Please also refer to your vehicles manufactures instructions for the best location for devices that need to receiver a RF signal. Caution: Make sure you do not position the detector in your normal clear field of vision. This will block your safe view of vehicles, motorcycles, cyclist, pedestrians and other potential hazards. 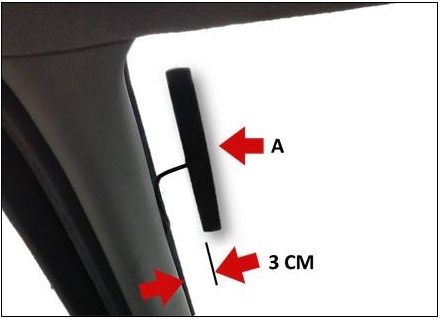 All vehicle now days have a heated rear window, if you are mounting a Higher Gain Antenna in the rear window, ensure that the Antenna is not mounted on top or close to the Heater Elements; as this can block some Transmitted RF Signals to the Detectors Antenna and reduce the detection capability.